The amount of gear that modern infantry soldier carry into the field has consistently grown over the years. The new Steiner S-Series battle sights ensure that the optics contribute more performance for less weight. 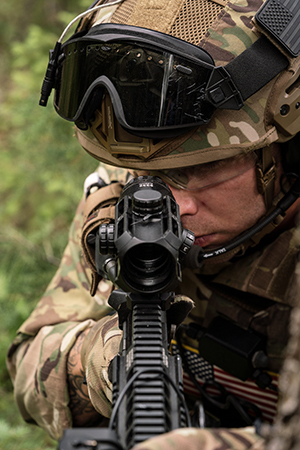 These next-gen prism battle sights have it all — wider field of view, larger eye box and eye relief, faster acquisition, simple operation, unmatched optics and accuracy. There are two sights in the series—S332 with 3x magnification and S432 with 4x magnification. Versatile enough to be utilized on carbines or machine guns, they provide shooters with a clear aiming point in all light conditions and all battlefield scenarios – from close quarter combat to medium range engagement or any situation in between with the ability to retarget instantaneously. A large eye box and quality glass provides brilliant clarity in all environments while simple rotary digital controls located on the side make adjusting windage, elevation and reticle brightness convenient. Both sights come with the easy-to-use rapid dot reticles that are available in 7.62 and 5.56 calibrations. Additional attachment points are provided for adding lasers and other accessories. The S-Series is designed to never fail. It is waterproof to 10 meters (33ft. ), 100% fogproof (nitrogen filled) and can withstand up to 900 Gs of impact. Both sights are powered by one CR2032 battery. This entry was posted in Optics, Optics and tagged battle sights, S-Seriees, Steiner. Bookmark the permalink.